This is a 0.24 carat Round shape, D color, SI1 clarity diamond accompanied by a GIA grading report. 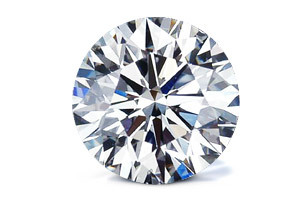 This diamond will appear smaller than it weighs because its weight is retained in the depth. It is cut with a deep pavilion (bottom of the diamond) that does not reflect light back through the crown (top of the diamond). Light leaks out the pavilion producing a dark appearing diamond that lacks sparkles.